How do I know if my site will be seen as “mobile-friendly” by Google? 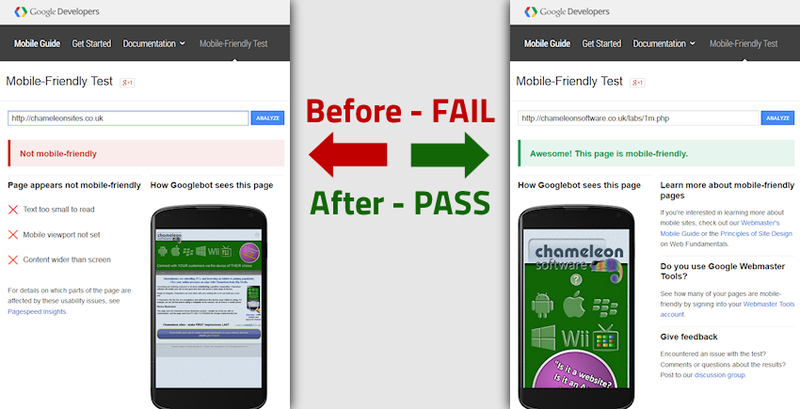 This will tell you whether your site passes or fail, and if you fail, some of the things that need addressing. And that’s where we come in. Given that you probably have a host of other things to be dealing with, you’ll be pleased to know that well over 90% of sites with our FREE one line script installed PASS the test. NOTE: The aim of our free tool is simply to move your site from FAIL to PASS against the criteria Google analyse in their test. This is step one in making your site mobile-friendly, and will buy you time to look at further improving the user’s experience, without losing your place in mobile search rankings in the meantime. We would of course be happy to discuss what would make your site properly mobile-friendly, with no obligation. So what do I need to do NOW to pass the test? We also offer a free demo of how your site will look once our code’s installed, just check that box on the form. You will be given a line of html code that calls a script to add our gecko mobile adjuster code to your site. This needs to be included in very much the same way as Google Analytics. Our free version of the gecko code (called ‘musketeer’) is a “one-for-all” generic solution – a “sticking plaster” which buys time for you to consider options. This is why your site is likely to benefit from further user experience adjustments to make it truly mobile-friendly for your users, rather than just technically mobile-friendly. We will make this free version of the software available to you for a minimum of three months from the time you apply, and aim to discuss further options with you during this period, but there will no obligation on you to take any services from us. You can choose the customised gecko code approach (‘knight’) a version of the code which is SPECIFICALLY tailored for your site, rather than a generic solution – from only £200 (NOTE this has changed from the previous published offer of £199, as Big Media has reviewed it’s pricing structure for 2016). Alternatively you may wish to have a new site which builds on responsive design by adding device recognition to your site.